Best-selling frames, bundled for value! For artists of all ages and abilities. Use paint, markers, decoupage or craft trims. Plenty of projects for special photos. 96 total frames - Perfect for big groups! Some of our best-selling frames, bundled together for artists of all ages and abilities! 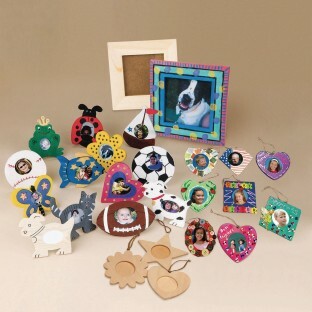 Use almost any medium – paint, markers, decoupage or craft trims. Plenty of projects for special photos. Includes 36 shaped “ornament” frames with attached hanging cords, 36 animal and sports themed frames with pre-printed lines and 24 classic frames to decorate any way they want! 96 total frames. Frame designs may vary slightly from what is shown.